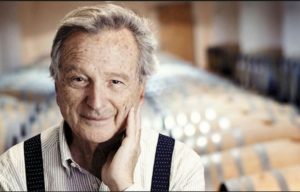 Spanish architect and professor, Rafael Moneo is among the best known on the international scene. He has made numerous projects all over the world and is the first Spanish architect to have received the Pritzker Prize in 1996. José Rafael Moneo was born in Navarra, Spain, on May 9, 1937. While growing up, he was first attracted to philosophy and painting. He did not have a clear mission to be an architect, but attributed his inclination towards the architecture of the father’s interest in the topic. In 1954, he left his family to go to Madrid for studying architecture. In 1961, he qualified as an architect at the Faculty of Architecture at the University of Madrid. His professor of architectural history, Leopoldo Torres Balbas was one of his biggest influence. After finishing his studies, he went to Denmark to work with Jorn Utzon. Before returning to Spain in 1962, Moneo says, “I traveled around Scandinavia, where I was lucky enough to be received by Alvar Aalto in Helsinki.” Once back in Madrid, Moneo won a competition to fill one of the architecture venues at the Spanish Academy in Rome, Italy. This period of his life had a great influence on his later work. On his return to Madrid in 1965, he received his first large commission, Diestre design factory in Zaragoza. In 1972, he won the elements of the composition in ETSAB, which led him to live for almost ten years in Barcelona. From the late seventies and early eighties, he became a visiting professor in both Princeton and Harvard University’s architectural schools, and University of Lausanne, Switzerland. In 1980, he obtained the professorship at the School of Architecture in Madrid for five years. 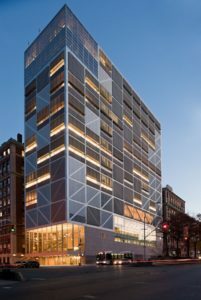 In 1984, Moneo was appointed Dean of the Faculty of Architecture at the Graduate School of Design at Harvard University, a position he held until 1990. He returned to Spain in 1990, with many new projects but his ties with Harvard University continued by teaching for two weeks each semester. 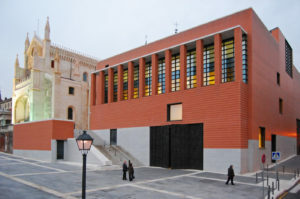 In 1992, Rafael Moneo received the Gold Medal of Merit in Fine Arts from the Spanish government. In 1996, he was awarded the Pritzker Prize for Architecture, the Gold Medal of the French Academy of Architecture and the Gold Medal of the International Union of Architects. In 1997, he was nominated Academic of the Royal Academia de Bellas Artes de San Fernando in Madrid and received the honorary doctorate title of Royal Institute of Technology in Stockholm. In 1998, he received the Feltrinelli Prize of the National Academia dei Lincei, Rome. He is a member of the American Academy of Arts and Sciences, Academy of Saint Luke in Rome and the Royal Swedish Academy of Fine Arts. In 2012, he is awarded the Prince of Asturias Award for the Arts. Which Are His Most Notable Works? 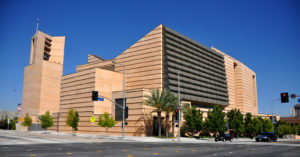 The Cathedral of Our Lady of the Angels is designed by the Spanish architect Rafael Moneo and opened in 2002. 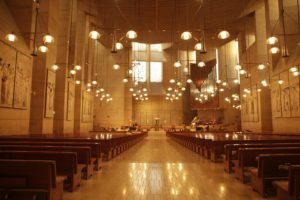 Also known as the Cathedral of Los Angeles, the building occupies a space of 58,000 square meters as a monument to San Vibiana, a Roman martyr of the third century and patron saint of Los Angeles. 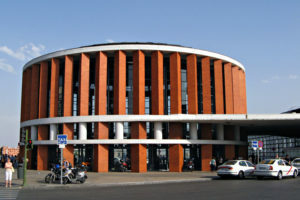 The cathedral was designed in an unusual postmodern architectural style and has a minimal exposure of the right angles, which looks more like an imposing fortress than a cozy place of worship. Many critics believed that the plans for the church were too elaborate, such as the cost of 3 million dollars for the large bronze doors that, instead of showing biblical scenes, presented symbolic images corresponding to the Christian mystical numbers. However, Cardinal Mahoney had great visions for the cathedral. With the themes of “Light” and “Journey” in mind, the architect Moneo has incorporated within it large windows of Spanish alabaster. 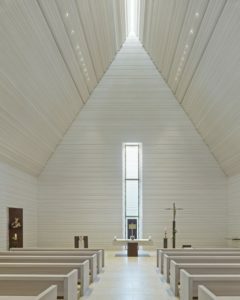 As such, it is said that the cathedral shows the greatest use of alabaster in the United States. The cathedral was specially built to be six feet long, one meter more than St. Patrick’s Cathedral in New York. The lower level of the building features a modern and light-filled mausoleum with 6,000 crypts in the basement of the cathedral. The mausoleum features stained glass windows of the original cathedral and Judson Studios, one of the oldest liturgical studios in North America. 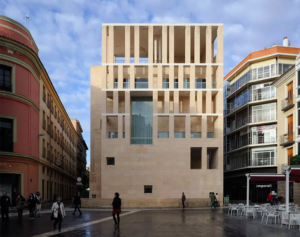 The Spanish architect Rafael Moneo won the VI edition of the International Prize of Sacred Architecture, aimed at new religious buildings of Christian worship made throughout the world. 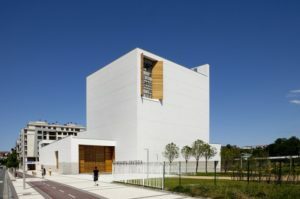 His Church of Iesu, in San Sebastian (Spain), with clean and compact forms, alternating full and empty, won the Jury, which unanimously decided to award him the first prize. In balance between emotion and rigor, the Church of Iesu (inaugurated in 2011) is located in one of the most recent districts of the Basque city, where the religious building comes to a new reference point. The architecture, which Moneo himself defines as “generous in space and very modest in materials“, stands out for the abstract and minimalist white of the walls, an element that recalls the dominant color of the flowers in the nearby park and above all the important rationalist constructions present in San Sebastián. The complex consists of three elements: the church proper, placed inside a cubic volume and facing east; a L-shaped body, which houses several rooms including the parish center; a wall that closes the patio-garden located between the two buildings and that filters the passage from the open space of the road to the mystical one of the temple. The nave of the church has a cross plan, created within a larger quadrilateral; in the spaces that complete the figure there are, on the left, the sacristy and the baptistery, and on the right, the Chapel of the Blessed Sacrament and that of the Reconciliation. The cruciform system of the tradition is actualized through an asymmetric design, which gives a way to “reflect the tensions of today’s world“, according to what the architect himself says. A fundamental role is played by natural light which, by entering the interior in different ways, manages to connote each space in a peculiar way. In particular, the zenith lighting of the main nave emerges, due to the openings placed in the roof which highlight its cruciform structure and capable of immediately evoking the Gospel message and transporting the faithful into a mystical dimension. Also worthy of note is the large stained glass designed by Moneo himself and made of alabaster and glass inserts representing a cross, a sun and two moons in distinct phases. The Spanish architect wanted to explore the concepts of necessity and contingency in architecture. He noted that a field is needed in the architecture of the city, “where the architecture used to manifest all its splendor, where it still urgently needs discipline”. While lamenting the fact that those who care about architecture have greatly reduced. Moneo insists that “buildings are not the result of a design process or materialization“. “Once completed,” he continues, “buildings take on a life of their own. Of all the visual and plastic arts, architecture is probably one in which the distance between the artist and his work is the greatest. Architecture involves distance, so that in the end the product is left alone, self-supporting. A work of architecture, if successful, it is possible to eliminate the architect “.